Palisades - some general comments. Over the last several months, I have received numerous questions about Palisades Nuclear Power Station which is located near South Haven, Michigan and which is presently operated by Entergy Nuclear Operations. I have until now declined to comment as most of the inquiry has concerned personnel issues, which are all too well described in the various NRC releases and findings which the press have seized upon. Since these things are well covered there has been no need to respond. However, a new allegation has arisen which is similar to one I confronted about a plant in Japan some time back. First, some background. Palisades is a Combustion Engineering pressurized water plant which was ordered by Consumers Power in January 1966. According to an official Palisades press kit issued by Combustion Engineering and Consumers Power which I have here, Palisades was the first nuclear station in the United States that was not a "turn key" project contracted to a single firm; rather, Consumers Power contracted Bechtel Corporation for general consulting and engineering services, and the two firms, working closely, independently ordered all of the equipment required to construct the station. Original plans called for four identical units at the site, but only one was ever begun. This plan did lead to the single completed plant being referred to as "Palisades Unit 1" in some publications in the late 60's and early 70's which could lead to some confusion if this fact wasn't clearly described. The reactor thermal output as built was 2200 MWt; the Westinghouse turbine generator at that reactor power produced 710 MWe of power although it was rated at 845 MWe maximum. The 2008 data for the plant are a reactor thermal power of 2565 MWt and a corresponding net electrical output of 778 MWe. Modern data from Entergy indicates a net electrical output of 798 MWe. When this plant was built, Consumers Power had been operating Big Rock Point Nuclear Plant since 1962 (this was a GE BWR/1 plant.) Consumers Power was also at that time building the Midland nuclear station, a two-unit Babcock & Wilcox plant that was never finished. Palisades achieved initial criticality May 24, 1971 - about a year behind the original ambitious schedule. 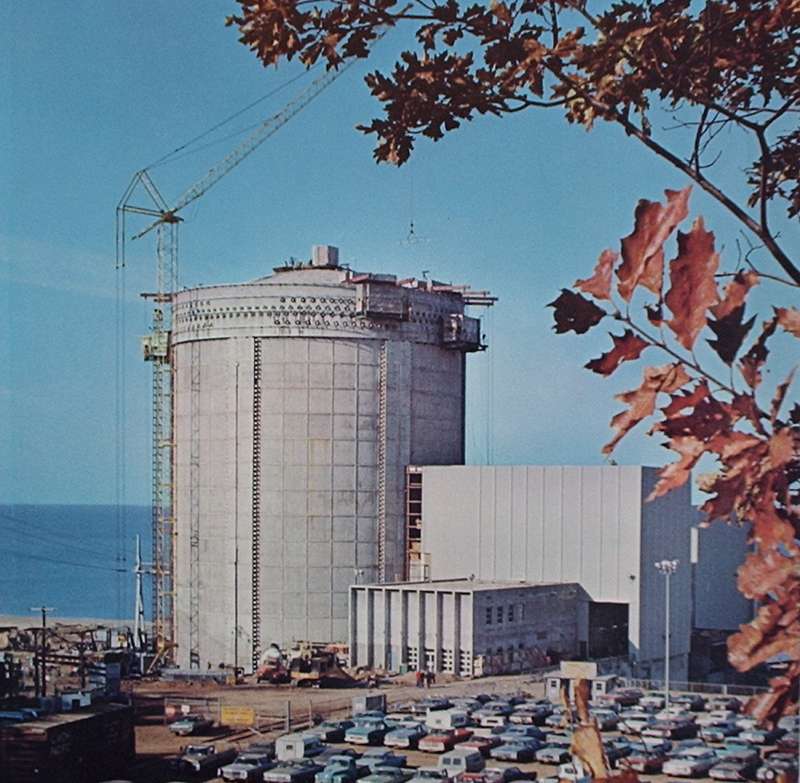 The plant first delivered power commercially on December 31, 1971 (both dates according to WASH-1203-73, US AEC 1973.) Like many other plants, Palisades had some initial problems that had to be ironed out but they weren't nearly as bad as those at some other plants built both before and after. Palisades' earliest serious unplanned outage took place starting at about the middle of 1973 to repair leaks in "B" steam generator. The photo here, courtesy AP and which is an old AP Wirephoto, shows Palisades in October 1974 while undergoing testing after the year long outage. Notable is the addition of cooling towers - these were not a part of the original plant design which used only lake water for plant cooling. The Combustion Engineering - Consumers Power press kit (which is from early 1970) makes no mention of, and does not show, any cooling towers. Note the excavated area beyond the plant where the second unit would have been constructed. Entergy bought this plant from Consumers Power in April, 2007. "Palisades must be shut down"
This commentary needs some sober observation and reflection. This exact same kind of argument was brought up some time back concerning Genkai nuclear station in Japan. I conducted a VERY thorough description of reactor vessel embrittlement on Atomic Power Review at that time - and it's applicable here. -The NRC has never weakened safety regulations. When new analyses are made, then old ones which are less accurate are reconsidered. This process can both help and hinder relicensing processes for plants. -No "old, degraded" reactors are operating. None exist. -The phenomenon of PTS or "Pressurized Thermal Shock" was originally developed in the early 1980's after two incidents (one at Palo Verde, the other at Crystal River) gave evidence that there was a remote chance that the design basis accident causal mode known as brittle fracture (this being relative to the reactor pressure vessel) which had never happened even once could possibly be induced by a pressurized thermal shock sequence wherein a pressure vessel was taken from hot, critical normal condition through a rapid cooldown and depressurization, and then a rapid repressurization. The fear was that while no vessel had ever experienced the dreaded brittle fracture failure, so that this eventuality (still designed against) became highly unlikely, there could be some other chain of events that would essentially duplicate it but would be much less immediate, more nuanced, and harder to prevent. As it turns out, there were massive discussions about PTS in some quarters during the first half of the 1980's but as a practical matter later, much better knowledge of how pressure vessels age has lowered concerns... largely through the use of sample materials placed in high neutron flux areas inside reactors, which samples are then removed and tested exhaustively. According to Gregory Myerson the NRC found a solution to any serious worry about PTS was to order alteration to the alloy used to fabricate reactor vessels and did so as early as 1971 - while monitoring any vessels built prior exceedingly carefully to ensure they don't pose any increased risk. To date, none has been identified. The commentary then soars off into ridiculousness, with every incredible worst-case type assumption and scenario being topped by the next one. As such it's easily recognizable as anti-nuclear hyperbole and hype. But... what DID the NRC resident inspector really say? Probably, the inspector wished to convey that neutron damage to a pressure vessel really consists of the displacement of atoms from their normal positions in the crystalline metal structure or lattice. This makes essentially gaps that are one atom wide. Not exactly the holes this commentary describes. Moreover, this damage is easily designed against by careful control of materials used in the pressure vessel, careful manufacturing and extremely generous allowance for the effect of the damage over decades so that even with embrittlement the vessel still behaves normally and can handle the original specified temperatures and pressures. Some plants have very old vessels which require some modification of the allowed rate that you can heat up or cool down the vessel - but this is normal for very old vessels, frankly. As mentioned in my Genkai article, so much monitoring and study is being done and has been done that vessel embrittlement is probably one of the most studied metallurgical phenomenon to come out of the whole history of nuclear engineering. 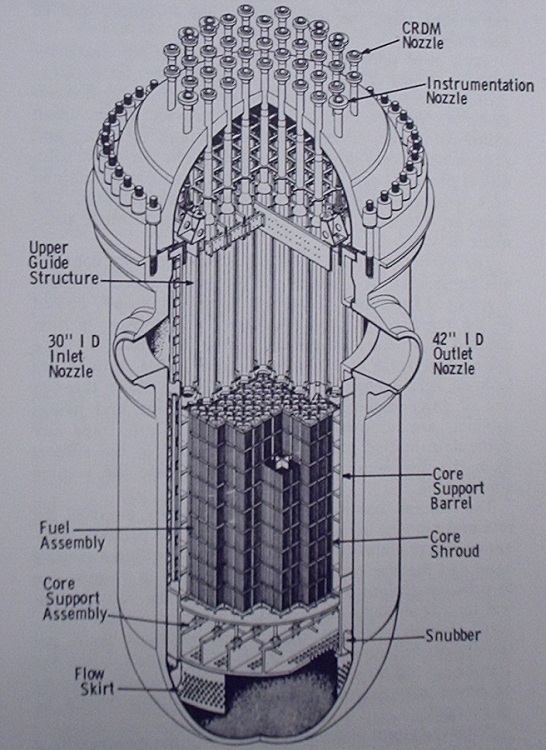 Left, reactor vessel and internals, Palisades Nuclear Power Station, as originally built. Getting now to the present NRC findings - which have far more substance than the allegations of embrittlement - there will be a public meeting tomorrow night (February 29, 2012) that will likely gain some attention. Click here to read one article about the meeting. Click here to read another. I will be watching to see what comes out of these meetings and report on it here. It suffices to say that the personnel issues brought up seem to have more substance than any of the reactor vessel issues the activists are attempting to invent. It is those on which the attention must be cast. Click here to view Entergy's page on Palisades. NOTE: Some questions were received about San Onofre, in California, which also has Combustion Engineering plants whose (new) steam generators were found to be leaking very recently. These new steam generators were built by Mitsubishi in Japan, and so there is no direct correlation at all between the primary-secondary leaks at San Onofre and any other Combustion Engineering plant. Labels: "embrittlement", "palisades", "pressure vessel", "san onofre"
Frontline will be airing its second piece in recent months on nuclear energy - this time focusing on the Fukushima Daiichi accident and events on and off site at the time of the accident. The Nuclear Energy Institute (linked on the right panel of APR) has representatives who will be watching the special and tweeting in real time. You can follow NEI tweets using @N_E_I. NEI notes the use of twitter hashtags #fukushima and #frontline. For those who wish to have detailed reports of the accident chronology as well as assessments by recognized governmental and industrial bodies, I highly recommend use of the new page on this site which is labeled "Fukushima Daiichi Accident Reports" and which is linked from the right side of APR. Or, you can click here. Frontline will also be tweeting using @frontlinepbs if readers would like to follow that account as well. Labels: "frontline", "fukushima daiichi", "nei", "pbs"
It's time for another roundup of widely published and not so widely published nuclear energy news... but first, a note about a new APR feature. Sharp eyed readers may have noticed the appearance of another link in the "Pages on this site" section, labeled "Fukushima Daiichi Accident Reports." This new stand-alone page gives links to all of the official compilations of accident events, reports on the actions taken, analyses of the quality of the response by official bodies, and so forth. It is intended to be a single stop clearinghouse for finding official (and thus realistic) appraisals of the events leading to the accident, during its progression, and during the recovery. I will continue to add more links as I find them so that this resource continues to be relevant. Now to the news. FUKUSHIMA DAIICHI - There appear to be some further intermittent problems with some of the temperature indications at Fukushima Daiichi No. 2 plant; TEPCO seems unworried by these random spurious indications, even though it states that it continues to monitor No. 2 containment for xenon. In a separate area, TEPCO has decided that movement of barges and small vessels inside the breakwater which are anticipated for further recovery work would stir up the contaminated sea bed; therefore, TEPCO will soon begin covering the seabed inside the breakwall with concrete. According to TEPCO's press releases the equipment for this work is already on hand. More on a previously reported story -- Denki Shimbun has a good article on the price Japan is paying for shutting down almost all of its nuclear generating capacity. Byron Station (Illinois) has received an award for progress in developing onsite wildlife habitat by the Wildlife Habitat Council. Click here for a short story. Byron has been certified under WHC's "Wildlife at Work" program; click here to read about this program. Pilgrim Watch, an activist group who would like to see Pilgrim Nuclear Power Station shut down (Pilgrim is a GE BWR/3 in a Mk I containment at Plymouth, MA) have been turned back again at reopening a hearing concerning Pilgrim's licensing -- but they have been joined by NRC Chairman Jaczko (who dissented with the other NRC Commissioners who all voted to halt this attempt by Pilgrim Watch) in the sentiment that more public questioning on Fukushima related issues is needed. Click here to read more. It certainly seems to be getting more and more clear as to whether or not Chairman Jaczko feels as if all new plant licensing, relicensing and construction should wait until every last possible deduction from the Fukushima Daiichi accident has been made - but those could continue for twenty years. Discretion might be the best part of valor, but he who hesitates is lost; the energy policy of the United States is what hangs in the balance. Speaking of post-Fukushima unfounded fears, we have on the opposite side of the spectrum the president and CEO of Ontario Power Generation coming right out and saying that post-Fukushima fear should not be allowed to stop the public from understanding the potential of nuclear energy - and in a way he's glad that the nuclear industry has been pushed back into the spotlight. Click here to read a very solid, pro-nuclear but definitely post-Fukushima article about nuclear energy in Canada. Alstom is so sure of the nuclear renaissance that it's expecting good things from its now two-year-old plant in Chattanooga. According to Alstom's CEO, the nuclear renaissance is delayed but not scuttled by any means. Click here for a brief article. That's this week's late-week roundup! Atomic Power Review has a TWITTER account (@atomicnews) as well as a Facebook page, and a YouTube channel, all of which are linked from the right side panels of the APR site. Japan should consider restarting nuclear plants. Thanks to Dan Yurman and Margaret Harding for the tip on this developing story. As of today, there are increasing reports out of Japan that various industries and private companies are feeling a serious pinch due to the shortage of electric power - a shortage that is going largely unreported in the West. Click here to see a great roundup by Bloomberg of the plants now shut down. Click here for an interesting pre-paywall story tease at Petroleum Economist. Daily Yomiuri has a good piece on the struggle and issues as well. It is this author's opinion that the anti-nuclear sway in Japan has become seriously and irresponsibly overwhelming. The plain fact of the matter is that none of these IAEA or otherwise developed "stress tests" are going to do anything to reassure the public, overall, about nuclear safety. What will do something is to successfully get plants back on line generating electricity without incident. It my opinion that the best course of action that Japan could take would be to develop a two-tiered recovery plan regarding nuclear safety. Those nuclear stations which are considered in very high tsunami risk areas are the only ones that should remain shut down for an extended period until tsunami protection is in place. Japan's nuclear plants have sustained serious earthquakes for decades with no troubles until now of any note; thus, the plants that are not in tsunami threatened areas should be given a thorough but brief inspection by the Japanese authorities - without waiting for the development of the new agency - and restarted before Japan's economy worsens seriously due to lack of industrial production. At what point in the past would Japanese manufacturers have considered outsourcing production, or moving their manufacturing offshore? The answer is that they would never have - it is an essential part of Japan's economy that the vast majority of its products are manufactured in Japan. Only now, with a serious energy shortage, is this considered. The effect on Japan's economic health is shown all too well in the articles I've linked above. The time to hide behind fear and uncertainty is over. The Japanese should stand on the previous forty years of safe nuclear operation and restart those plants which can meet immediate safety standards as soon as it is possible to do so. To do otherwise is to threaten the nation's economic foundation. ADDED NOTE: Perhaps Japan should look at the example India is setting; India plans to have roughly 63,000 MW of nuclear generating capacity installed in twenty years' time. This would be a good place for Japanese companies to move their factories in order to take advantage of more reliable energy and (probably) less expensive labor. Other nations are not standing still waiting for stress tests. Click here for a full story on India's nuclear build program. Carnival 92 - link here! The 92nd Carnival of Nuclear Bloggers is up at the American Nuclear Society's ANS Nuclear Cafe blog right now. Click here to get to Carnival 92! This rotating feature gives all of us a chance to get a finger on the pulse of the pro-nuclear blogging world every week. If some topic or other appears in common on multiple posts submitted for the Carnival, you can bet that it's highly newsworthy and relevant - and this week's Carnival is no exception. If you have not already done so, do yourself a favor and go check it out. It's been a while since I've rounded up some of the more interesting news in the world of nuclear energy; thus, it's time for another Atomic Power Review. FUKUSHIMA DAIICHI - TEPCO has arrived at the conclusion that the single lower pressure vessel high temperature reading is erroneous, but not before injecting boric acid twice and vastly increasing the injection rate (both core spray and feed line.) TEPCO then resistance checked the detector and found it to be faulty. As of February 16, the reading on this instrument dropped from the 200C range to roughly 0, and at times is now reading negative (below freezing) temperatures. TEPCO indicates it will drop the injection rate to the reactor, which it may have already by the time this is published. NUCLEAR ENERGY IN THE USA. It has been brought to the attention of the nuclear industry and professional organizations that CNN has developed a fairly heavily biased story (and will run a TV segment, Sunday) concerning boiling water reactor plants which incorporate the Mk I containment. Allow me a few observations - having seen the online version. Immediately, I'm struck by the fact that the CNN piece describes the plants of interest as being "GE Mk I reactors." There are no Mk I reactors. I have explained this exhaustively on this website before ... here are some links. Click here to see an old but thorough video I made and which is on the APR YouTube channel that shows many facets of the Mk I pressure suppression containment, and related plant details. This was made for non-nuclear people to examine as well as those in the business; feel free to pause as needed. I recommend viewing it full screen or else as large as possible. Click here to see an April 2011 article describing the difference between models of GE boiling water reactors (such as "BWR/3") and types of containment structures (such as "Mk I.") Note the many backlinks to even further APR descriptive stories. This article is a really good sort of "Nuclear 101" entry. Now that we have our nomenclature fixed, let's turn to the real purpose of the CNN article, which namely is that of getting people everywhere to tie the Mk I containment to the Fukushima Daiichi accident. Let me be brief and clear - the real cause of the accident was the tsunami, which flooded the plant causing a loss of all AC and eventually DC power. This robbed the operators of all indications and all remote operability. Core damage in this condition was inevitable. This would have occurred whether these plants had Mk I pressure suppression containments, or Mk II or Mk III or, for that matter, dry ambient or ice-condenser PWR containments. The article DOES go on to say what I've said above, to some degree. What it then does is assure us that the Mk I containment is unable to do its job - which is to contain the results of a major nuclear accident. What the article does NOT say is that many years' worth of work has been put into modifying and updating Mk I containment structures at all US plants which have them, and that it continues to be put into them even now. Click here to see a report I did on exactly this some time back. And, you can click here to see a recent document filed at the NRC from the BWR Owners Group discussing just one aspect of continued Mk I modifications - hardened wetwell vents. Seeing this information, it is clear that the NRC, GE, the architect-engineer firms and the Owners Group are working continually on making improvements and modifications to these plants as the needs arise and as new issues are brought to light. On the balance, the CNN article should have given more weight to the facts concerning continued effort to ensure safety of all plants which incorporate Mk I containment buildings. INDIA - Nuclear Safety Regulatory Bill stopped by committee. Click here. In this author's opinion, it would be wise for the nuclear industry in India to get the public informed on what proprietary information is -- information that could be sensitive to the business of a company -- and inform the public that the 'right to know' legislation should not cover such data for the simple reason that such data are not likely to be of any use, ever, to the public. Further, the article says that information related to nuclear safety would not be disclosed if proprietary information were withheld but this is far from the case. Proprietary information is NOT safety-related information. We see here a nation just beginning to have open discussion and debate about nuclear energy and nuclear energy safety .. and the growing pains are all too obvious. Further on India.. India's first nuclear powered submarine is about to go on sea trials. The ARIHANT is powered by an Indian-built 80 MW pressurized water reactor. A sister ship is under construction. Click here. Click here for an exceedingly detailed history of India's leased nuclear subs and its indigenous construction program including some historical perspective on its submarine PWR program. Click here for fas.org open literature summation on the Indian nuclear sub program. KENYA - UN says "hold on" to a nuclear future in Kenya. Click here. One has to wonder what the motivation of the UNEP actually is in this case. Oh, wait a minute - we DO know, because the references to the UNEP report go on all the way through warning of global disaster. (Read the full article all the way to the end.) And somehow, Kenya is supposed to bank on low-reliability and low capacity factor solar and wind and geothermal energy to move forward. I would have to say that considering the number of solar companies that have failed, and given the low overall KW/H output of 'renewables' that nuclear would be a far better bet production wise and would also give Kenya a place and a reason to really focus serious technical education. Not that Kenya will go down this path. What this author finds alarming is the lock-step UNEP slapdown of nuclear in line with present thinking in Europe - or in some parts of it. VIETNAM - ROSATOM promises quake and tsunami safety for Vietnam's first nuclear generating station. Click here. If Vietnam is to go nuclear, it's a sure bet that its nuclear plants will have to be built to the most rigorous and up to date specifications for both quake protection and tsunami protection; ROSATOM, selected to build Vietnam's first station starting in about two years, assures the nation that the plant will tap the company's long experience of building plants world wide in many harsh conditions and that it will be the safest possible. ROSATOM assures protection even against quakes as strong as 9 on the Richter scale. That's all the news for this edition. Keep watching for further Fukushima Daiichi updates as well as US Nuclear Renaissance news. This writer's assumption of February 7 seems now confirmed by TEPCO, who are now saying that the high-reading instrument near the bottom of the reactor vessel at their 1F-2 plant is likely failed. The detector has failed a resistance check performed by TEPCO, meaning that the indication is confirmed incorrect. Author note: I do apologize to ALL of you out there whose e-mails I have not yet gotten to. I am buried under them at the moment and am trying to dig back out! Please be patient and I will answer everything which requires an answer that is in my inboxes. MEREDITH ANGWIN has put up, this evening, the 91st Carnival of Nuclear Bloggers at YES VERMONT YANKEE. As I've said so many times before, if you really want to get the true substance of what pro-nuclear bloggers think is the most important information to get out and the most important items to discuss, then you've got to check the Carnival (wherever it is being held) every week in order to keep up. Many of the top nuclear blogs in the world have hosted the Carnival, which rotates between them and appears at the end of every week. Rain or shine. Click here for Carnival 91 at Yes Vermont Yankee! Vogtle COL approval vote indicates perspective on "nuclear renaissance"
Quite a number of people, including this author, have used the term "nuclear renaissance" to indicate the present tide that appears to lead to at least six new nuclear plants within the decade at a total of three sites, and the term is in fairly wide use. Some people not aware of the overall history of nuclear energy in the United States may wonder how this term really applies. To fill in that gap, I hereby present a VERY truncated history of commercial nuclear energy in this country, with a specific focus on the rundown in the mid-70's. This will help to give perspective on just what was lost in this country when the nuclear industry infrastructure ran down. Prior to National Nuclear Science Week, many sites gave details on the first nuclear reactor to operate anywhere - this being the CP-1 pile near Chicago in 1942. After this, a number of military Manhattan Project weapons-production reactors were built and programs were begun right after the end of the Second World War to develop nuclear energy as a real, useful tool. The first and best known program to accomplish this result was that of the Navy. The Atomic Energy Commission (and with it, later, a special branch of the US Navy's engineering bureau known as the Division of Naval Reactors, later NAVSEA08) launched work on two different designs with the hope that one would yield fruit. One was Project Wizard - a pressurized water cooled reactor whose design and construction were assigned, with AEC co-operation, to Westinghouse Electric. The other was Project Genie. This program was originally (according to notes here in the APR collection from Admiral Hyman Rickover, head of the Design Branch of the AEC and Chief of the Navy's nuclear engineering staff and bureau) conceived as a civilian powerplant project using a sodium cooled reactor. When this program ran into financial trouble, it was militarized and handed over to the Navy for completion as a submarine power plant. The project was awarded to General Electric. History is clear on the outcome; the Westinghouse plant worked so well that it was surprising, while the GE plant failed quite badly due to problems inherent in the physical design and construction of the plant which were intractable. The Westinghouse plant was first started up in March 1953; a copy of this plant was installed in the submarine USS Nautilus, the first nuclear powered vessel of any kind in the world; the submarine went to sea in January 1955. This marks the beginning of the use of nuclear energy to provide useful power in the United States. While many military programs developed rapidly, another step was required to move nuclear energy into civilian, commercial power generating operation. This step was made when a project to power a nuclear powered aircraft carrier for the Navy was cancelled and turned into a civilian project (the reverse of the GE sodium cooled plant's process.) This plant, originally known as the CVR project, became the Shippingport Atomic Power Station. 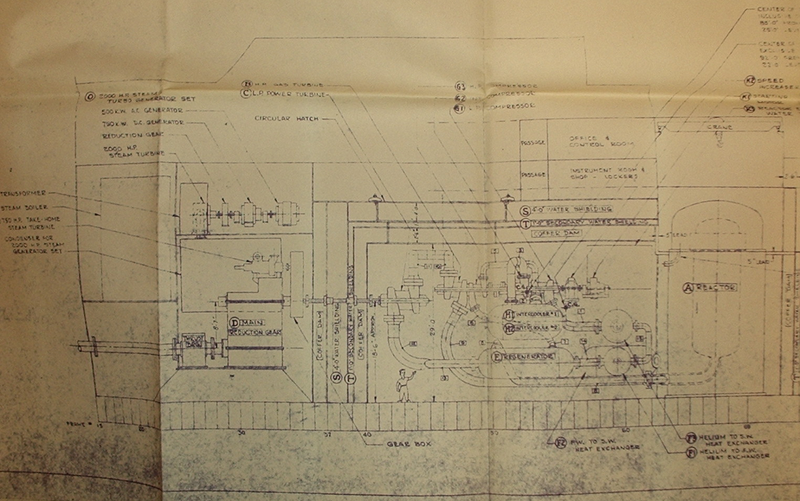 The project was originally known as the PWR project (for Pressurized Water Reactor) and was authorized by the AEC in July, 1953 - just a short time after the Nautilus' prototype plant first became operational. At the same time, the Joint Committee on Atomic Energy (a joint Senate-House affair) made a request to the AEC for details on a five year atomic energy development program. The AEC responded early the next year with a plan. In another coincidence, in the same month that the Nautilus went to sea (January, 1955) the AEC announced its Power Demonstration Reactor Program. 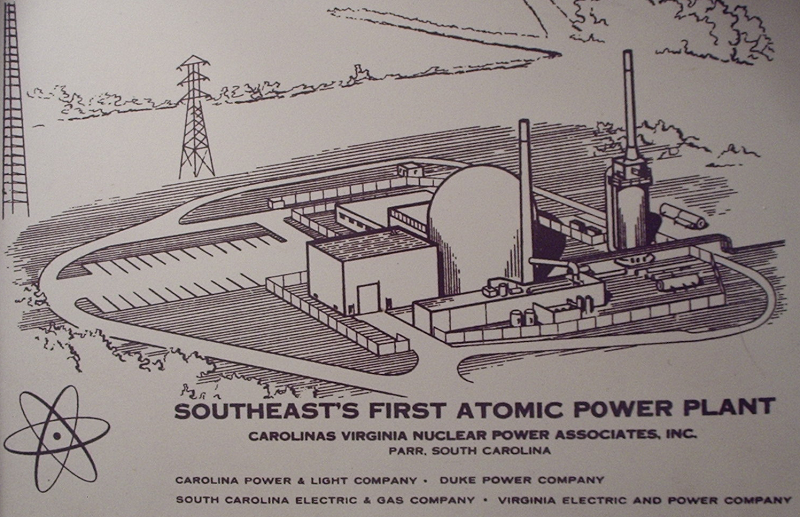 This program was essentially a program to encourage the construction of civilian nuclear plants of different technologies, with government assistance in many ways; nuclear energy was not yet economical when compared with other forms of energy generation, and only through development could it reach its potential. The AEC, seeing that few companies would likely risk only their own capital, provided assistance in the funding of new plants. 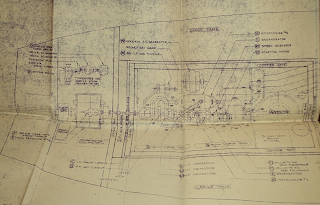 Shippingport was the responsibility of Westinghouse, already experienced with the Nautilus prototype plant (S1W) and the Nautilus' plant itself (S2W.) 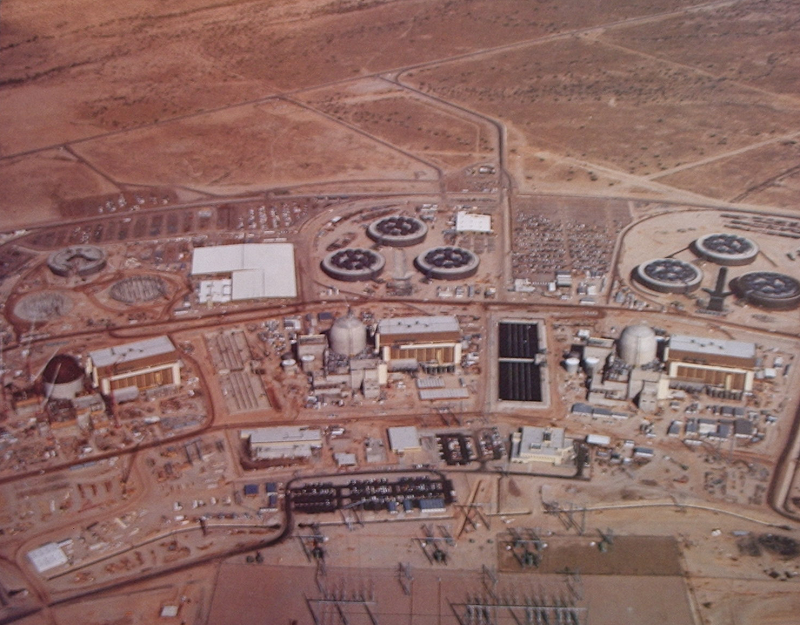 This plant was built with government funding for the nuclear portion, and private funding for the conventional (turbine generator, auxiliaries, switchyard, etc) portion. This would set the pattern for a number of Demonstration plants to come over the next decade. At the same time, General Electric decided to develop boiling water reactors on its own with no government support. 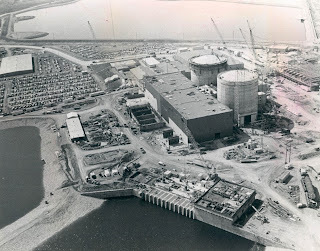 This project then developed over time into what would become the first totally privately funded nuclear station in the United States - Dresden Nuclear Generating Station - and it was running, for a while, neck and neck with Shippingport. Shippingport Atomic Power Station was completed and placed in commercial service in December, 1957, marking the first operation of the first large dedicated commercial nuclear power station in the United States. 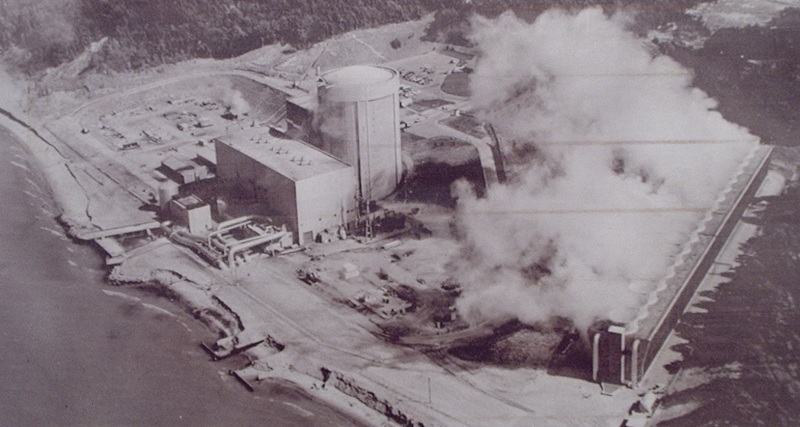 Dresden Nuclear Generating Station was first started up in late 1959. The era of commercial nuclear electric generation in the United States was underway. Above, detail from commemorative tray showing the CVTR plant and listing project participants. In 1960, the AEC announced a further "Ten Year Program" to make nuclear energy profitable, as well as to advance further reactor technologies. With all of the above mentioned programs in place, and the three rounds of PDRP plants being planned, built and operated, the true spread of nuclear energy around the country had begun. The years at the end of the 50's and during the beginning of the 60's saw relatively few new nuclear plants ordered per year. In 1958, three were ordered; in 1959, one. None was ordered in 1960 or 1961; in 1962, two were ordered. Five were ordered in 1963 (although one, Malibu, was never built) but none in 1964. 1965 was the year that saw the beginning of the real flood of nuclear plant orders. In that year, seven nuclear stations were ordered - and all of them were large, central station types with outputs in the high end of the range which at that time was in the hundreds of megawatts. From this point on, orders would skyrocket as indicated below. Source for the data immediately above is AEC publication "The Nuclear Industry - 1969" and a later version of the same annual, titled "The Nuclear Industry - 1971" which has publication number WASH-1174-71. 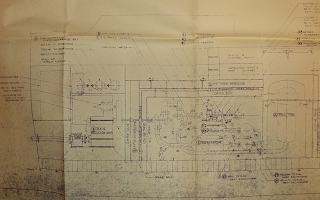 The first two commercial plants ordered from Combustion Engineering were Ft. Calhoun and Palisades. Above we see Palisades' containment building under construction. The economics of nuclear plants have very widely been discussed, both back during the 70's at which point we find our discussion, and today during the new nuclear renaissance. The fact of the matter is that economic considerations led to a shutoff of orders for new nuclear plants in 1978. Perhaps of greater interest is the incredible number of plants ordered, and on many of which construction began but which was never finished. According to "The Second Nuclear Era," between this order cutoff time period in 1978 and 1983 when that important volume was published, 58 reactors in some part of the ordering and/or construction process were cancelled. -Failure of the State government to allow operation. The fourth of these is actually highly significant, because it includes very many changes made as a result of the Three Mile Island accident in 1979. The TMI accident in 1979 caused an abrupt halt in NRC licensing (NRC had taken over from the old AEC) of new plants, and the initial result was a great deal of new safety problem identification and operator retraining. What really damaged the position of many utilities constructing plants was the incredible delay forced by the NRC until the perceived required fixes in the regulatory and operating frameworks could be identified, examined and implemented. 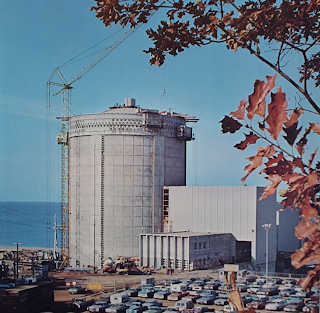 According to the official history of Enrico Fermi Atomic Power Plant - Unit 2, by Detroit Edison, the number of binding industry and regulatory rules covering reactor plant design and construction increased (in number only) from four in 1970 to 108 in 1973, to 541 in 1977 and to almost 2000 in 1982 (post TMI accident inclusions.) This drove engineering costs for Fermi-2 up from about $27 million in 1973 to about $275 million in 1983. It is clear that the delays and the increases in cost and changes in plant construction required by TMI killed many projects. No help was given by increasing EPA regulations that added cooling towers to plants and required other changes as well. All of this, coupled with lower load growth during the early 1980's than had been predicted, and economic slowdowns, explains the massive nuclear generating plant cancellations which occurred through the 70's and 80's. Above, Midland 1 and 2. Ordered by Consumers Power (Michigan) in 1968; major contractor problems, cost overruns, public outcry led to the plants never being completed. Both cancelled in the mid-1980's. By the end of 1985, the total number of cancellations reached 113. More were to follow, but at this point the majority of the cancellation bloodbath was over. A number of nuclear plants continued to be constructed, some rapidly and some not so. The last of the uncancelled plants to be completed was Watts Bar 1, which entered commercial operation in 1996. In terms of plants eventually completed, the last year in which plants were ordered and then eventually ever completed was 1973. Any plant ordered in 1974 or later was never completed. 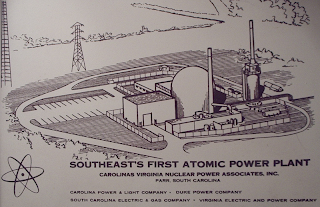 This then gives us a period from 1973 until this new "nuclear renaissance" during which no new nuclear plants were ordered; it also gives us a period from 1996 until a few years from now when Vogtle 3 and 4 go on line that is the gap between startups of newly finished nuclear plants in the United States. 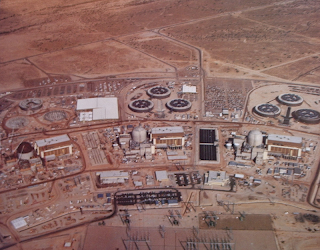 Ordered in 1973 and eventually all completed were the three reactor plants of Palo Verde. These were the last Combustion Engineering plants completed, and are the only CE System 80 plants (the last word in CE PWR plant design) ever completed. I hope this brief, and for many probably overly simplistic, timeline will help to indicate the ebb and flow of nuclear plant ordering overall in the US. So much misreporting in the press over the last 48 hours has been noted by this author that this post seems warranted. I hope it is put to good use by the major media. The long drought is over; a new energy future for America. Today's announcement by the NRC that the vote to approve COL's (combined Construction and Operating Licenses) for Plant Vogtle Units 3 and 4 has brought literally a firestorm of blog posts on all of the pro-nuclear blogs that this author follows - these are included in the link list at the right of APR. There have of course already been some anti-nuclear posts in other quarters. There is no worry concerning exaggeration when I say that today's event, while already predicted, is a monumental step. Indeed, this step essentially is the official (that is to say, regulatory) restart of the construction of nuclear power plants in the United States. This author had the good fortune to purchase (at a regular book store, no less) a copy of the work entitled "The Second Nuclear Era - A New Start for Nuclear Power" which was published in 1985, and authored by Alvin M. Weinberg, Irving Spiewak, Jack N. Barkenbus, Robert S. Livingston, and Doan L. Phung. This work essentially takes the nuclear energy industry and field at the immediate post-TMI phase, with a number of issues from the Presidential Commission still to be resolved, and tries to find a way to move nuclear energy forward. Alternate technologies are discussed, as well as the most advanced commercial PWR and BWR plants of the day. Many reactor safety aspects were also studied in this book, as well as some condensed nuclear energy history, some examinations of incidents and accidents, and a whole lot more. The essential points that this volume made to me back then (and of course anyone else who read it) were that in order for nuclear power plants to resume construction, there would have to be almost concrete proof to the public that they were safe; to that end, the authors selected the PIUS (Process Inherent Ultimately Safe) reactor as a prime example of the type of design that the public would approve of having built; that the public, once assured, would approve of further construction having never swung seriously anti-nuclear for long, even after the TMI accident; that safety was far more complex an issue than could be addressed simply by DBA approach, or defense in depth approach, or fault tree approach. We now find ourselves in essentially that exact world. Sentiment in the United States has continued to become more and more pro-nuclear in the years since TMI, and the continued rise in the number of those concerned with AGW (anthropogenic global warming) has coupled with a new rise in energy demand to fuel a new nuclear renaissance. (It was this renaissance which caused the launch of Atomic Power Review in April, 2010.) The Westinghouse AP1000 has passed the most serious and rigorous safety reviews imaginable, and has even endured having the Chairman of the NRC attempt to publicly detract from the integrity either of the design or the people responsible (or both) in an unprecedented display of lack of decorum, all to naught. Some people are certainly startled (and some appalled) that we are at this point less than one year after the Fukushima Daiichi nuclear accident. One of those is the Chairman of the NRC, Gregory Jaczko, who is the only one of the five NRC Commissioners that voted against approving the COL's for Vogtle. Jaczko has indicated that he feels that all of the post-Fukushima recommendations and changes should be implemented to the AP1000 design before it is built. Those persons everywhere with nuclear plant knowledge are quite well aware that the AP1000 is the most advanced design ever built in the United States in terms of nuclear safety. It is still unclear to this writer, even with his extensive knowledge of the Fukushima Daiichi accident (having covered it continuously since its onset) what possible additions could be made to the AP1000 that would further increase safety in LOOP and SBO scenarios. Today's decision by four of the five NRC Commissioners is the right call. Moving forward with nuclear energy that reliably provides base load generating capacity without worry about climactic conditions (solar energy requires daylight; wind energy requires wind sustained above a certain velocity) and without worry about greenhouse gas emissions is the sensible move at this point in our nation's still developing and still modernizing energy system. TOMORROW: APR will present some historical perspective on nuclear energy in the United States to bring today's development into sharper focus. You won't want to miss that! Today, the NRC has announced completion of its mandatory hearing to approve COL (Combined License) for the two Westinghouse AP1000 PWR plants at Southern Company's Plant Vogtle in Georgia. The NRC staff is expected to actually issue the COL's within ten working days, according to the NRC press release. The vote to approve the licenses was 4-1, with only Chairman Jaczko dissenting. The "Second Nuclear Era" in America has now officially begun. This borrows a phrase from one of this writer's favorite books; I will have an in depth article on the COL issuance, and related historical topics, later this evening. Additional info: NEI has a fabulous roundup HERE. See the story and other links to the right of it. BRAVO, NEI Nuclear Notes! Labels: "AP1000", "COL", "NRC", "vogtle"
It is time to make a brief update on two items of interest which have been brought up by certain media and which are now gaining traction in other outlets. 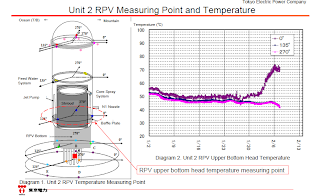 First, TEPCO has been reporting that one of three temperature indications on the lower reactor pressure vessel head at Fukushima Daiichi No. 2 plant has been rising slowly for days, although now it has begun to decrease. The other two temperature indications have remained essentially unchanged. 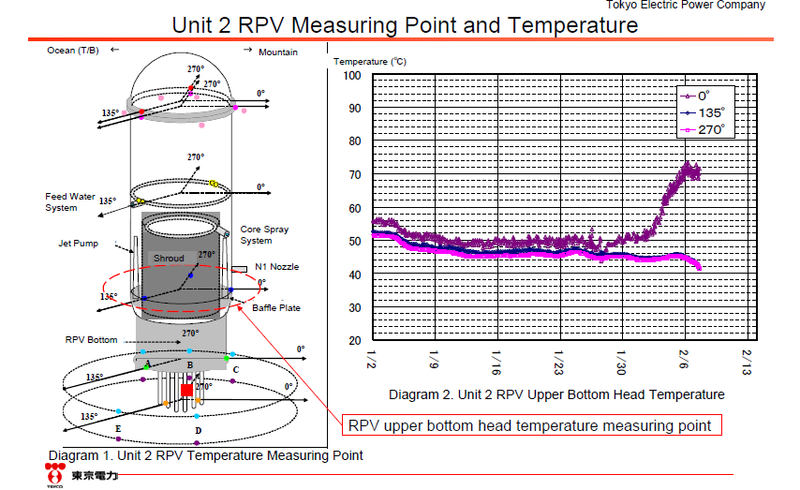 Click here for Feb. 7 PDF tabulation of lower RPV temps at 1F-2 plant. Below we see a fresh graphic from Tokyo Electric which indicates the location of the three temperature instruments, as well as a graphic showing the rise of just the single parameter as compared to the other two. Tokyo Electric has been monitoring the rise of this single parameter for some time now. No other parameter changes of note have occurred. For example, gas sampling of the containment at 1F-2 has shown no alteration of note. Tokyo Electric has been adjusting injection flow rates at all three damaged reactors for some time now in order to optimize temperature control vs. buildup of contaminated water; TEPCO has also been making some alterations in systems involving injection water sources and backup pump availabilities. TEPCO's opinion at the beginning of this trend was that one of its flow alterations (variance between feed ring flow rate, and core spray flow rate, as well as total overall flow rate) had caused some sort of flow rearrangement (this is only a paraphrase) which allowed an alteration of temperature at the one location. This writer's first suspicion is a progressing failure of the single temperature instrument. Barring this, it is conceivable that some disarranged portion of the internal structure of the reactor itself may have moved, causing the difference in temperature indication. For example, if part of the core further collapsed against the lower RPV head, this could conceivably be possible - however unlikely it is. It is also conceivable that any volume of accumulated, solidified salt from the time period early in the accident during which salt water was being injected may have moved, causing a similar indicated event. Having said all of that, there is no indication at the moment that any sort of increased risk exists as to further core damage, release of material, or recriticality. Even though this last mentioned possibility is exceedingly remote, TEPCO has, on Feb. 7th, injected boron into 1F-2 reactor as a wholly precautionary measure... although I should point out that at least once TEPCO has injected boric acid in an attempt to help cooling by dissolving perceived accumulated salt deposition. I will continue to monitor this situation and report on it as needed - but for now, the hyperbole of the main website in question (which I won't grace with a link) seems highly unfounded. The second overall Fukushima Daiichi concern is just a repeat of an earlier one; there is a thought that 1F-4 is in danger of collapse. The spent fuel pool of this plant was supported by steel girders, during a large construction project post-accident by TEPCO, and that space surrounding the girders filled with concrete, so that the spent fuel pool is now resting on a giant steel reinforced concrete monolith. Further, TEPCO is using giant cranes to remove debris and structural material (and, thus, considerable mass) from the tops of the damaged reactor buildings at 1F-3 and 1F-4 so that the risk of any collapse is further reduced. This "fresh" risk is also thus not fresh at all; TEPCO has no present concerns about this eventuality. As stated before, if anything develops further at Fukushima Daiichi, you can be sure it will appear here. Editor Note: In official TEPCO parlance, Fukushima Daiichi nuclear generating station is site "1F." No. 1 reactor plant at Fukushima Daiichi is thus "1F-1," No. 2 reactor plant is "1F-2" and so on. Labels: "fukushima daiichi", "TEPCO", "tokyo electric"
This week ATOMIC POWER REVIEW is proud to present the collective work of the world's leading pro-nuclear bloggers, with the return here of the rotating CARNIVAL OF NUCLEAR BLOGGERS. This weekly feature rotates between a volunteer list of pro-nuclear blogs and always showcases the best and brightest of those people who dedicate their time and effort to write about things nuclear. I strongly recommend to my regular readers world-wide a good review of all of the Carnival posts if they don't already do so every week. As has become the established custom here at Atomic Power Review, I do not generally make one of APR's posts also a contribution to the Carnival. This is not by any means a cop-out, because I spend a considerable amount of time and effort attempting to stump literally thousands of nuclear professionals with very rare and sometimes completely unidentifiable illustrations of things nuclear preceding each Carnival; I then explain whatever 'that contraption' was after the Carnival. February 4, 2012 and Carnival No. 90 will be no exception. Click the picture below to enlarge it - you'll need to if you wish to have any hope of guessing "What is this?" The answer and much more after the Carnival. Now, Carnival of Nuclear Bloggers No. 90! Many investors – large and small – that believe in nuclear energy and its potential to dominate the energy market want to find a diversified “pure play” where they can focus a portion of their portfolio. (Note: a diversified “pure play” on the technology would provide some protection to the fund from the risk of any particular project being mismanaged.) If the structure was a mutual fund, the size of the required investment could be well within the reach of anyone who buys stock funds for their retirement plan or their children’s college saving funds. Two fast moving stories caught people by surprise this week. First, the Salt Lake City Tribune reported that a key investor in the privately-held Blue Castle nuclear reactor project was being investigated by the Securities & Exchange Commission for alleged fraud. Second, The Tampa Bay Times reported that Progress Energy (NYSE:PGN) had cancelled its EPC contract with The Shaw Group throwing the future of the twin reactor project into serious doubt. It turns out there is a lot more to the rest of the story in both cases. The good news is that despite the startling nature of the reports the facts did catch up with them. The recent ruling in the Vermont Yankee court case invalidated several laws that the Vermont legislature had passed in order to close down Vermont Yankee. Now, without those laws, the Vermont Public Service Board (PSB) must rule for continued operation of the plant. PSB permission was required in the original contract when Entergy bought the plant. This post at Yes Vermont describes the implications of the judge's ruling for PSB deliberations. It also critiques some articles about the judge's ruling. An AP article is mostly a collection of quotes from Ray Shadis, a nuclear opponent. A Burlington Free Press article gives a fuller story. Often the case is made of the vast natural resources for renewable sources to tap into for electricity generation, often with the implication that such sources can displace baseload (and in particular, nuclear). Actual numbers of course are often a stranger to such conversations. In an effort to combat such widespread innumeracy, Steve Skutnik at the Neutron Economy lays out the answer to the question, "Just how many windmills would it take to replace one nuclear unit?" The answer: a lot. China will likely be approving only three or four projects each year from 2012-2015. This will be 12 to 15 reactors in the remainder of the five year planning period. The country had been accelerating its nuclear development since 2008, with 14 reactors approved in 2008 and six in 2009. The slowdown will effect the number of nuclear reactors that come online in the 2016 to 2020 period. The reactors under construction and the backlog of approvals will be for reactors that will be built by 2015. China should still have about 40 reactors and about 40 Gigawatts of nuclear power by 2015. Then China could slow to about 60-70 Gigawatts by 2020. I expect a return to more in reactor approvals to occur before 2015. In the meantime China will ensure that any generation 2 reactors get generation 3 safety improvements. They will also increase the percent of the reactors that are produced domestically. Paul Bowersox sends us the ANS NUCLEAR CAFE article of this week, written for the ANS blog by WES DEASON. Plutonium in Space: Why and How? APR note: Wes looks to be one of the bright new stars in the nuclear energy field! I would imagine we'll be seeing a lot more from him in the future in many ways. The unstable situation in the Middle East reminds Gail Marcus of the disruptions caused by the oil embargo of the 1970s. Between the Middle East and the cutoffs of natural gas from Russia that they've observed more recently, Europe is trying to enhance their ability to share energy resources in case of future supply disruptions. This is a step in the right direction, but of course, it doesn't create new energy. And that does it for all of our Carnival features for the 90th weekly edition. The only thing left is to tell you what that assemblage of equipment shown earlier represents. The illustration I presented earlier is actually only about one quarter of a large blueprint which illustrates a gas cooled, closed cycle, direct drive marine nuclear power plant. 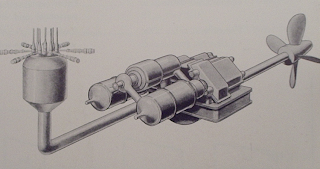 This is an exceedingly rare illustration, which comes from a set included with a copy of 'Study Contract MA 1252 - for 20,000 SHP Nuclear Propulsion System for Tanker" which was produced by the Research Staff of the General Motors Corporation and which is dated April 1, 1957. Many people are somewhat familiar with the nuclear powered NS Savannah, which incorporated a Babcock & Wilcox pressurized water reactor plant. Most are not aware that a very wide project which began slightly earlier called the Maritime Gas Cooled Reactor program was carried out, and which produced no sizable working hardware. A number of companies contributed detailed design proposals to the AEC and Maritime Administration for this project. 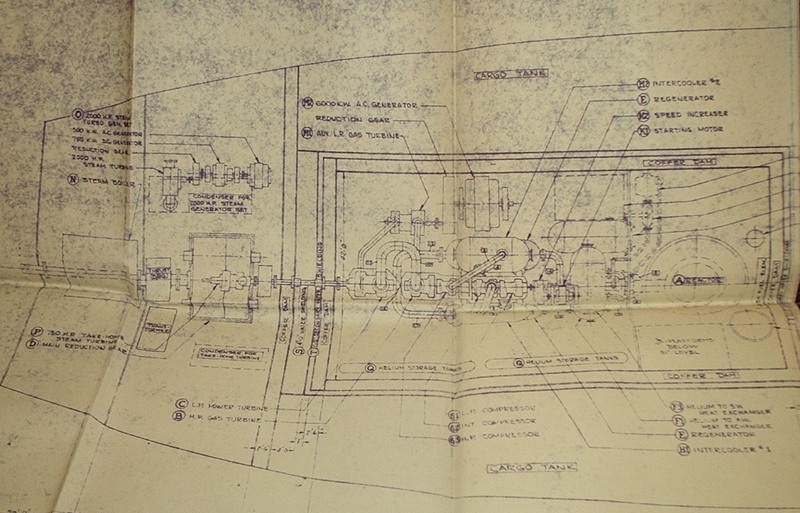 General Motors' project is shown in this drawing, and is seen in overhead view below in a portion of the same blueprint. Click to enlarge - very large! 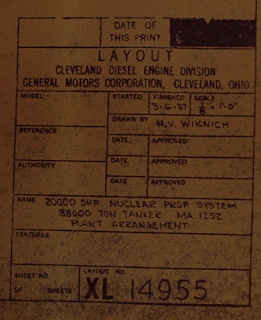 The "General Intent" portion of the report reads as follows: "This is a final report on a "Contract for Design Service" made and entered into as of the 13th day of September, 1956, with the objective of furnishing to the United States Department of Commerce, Maritime Administration, an optimum design of a 20000 SHP closed-cycle, gas turbine system with a gas-cooled reactor for installation in a 38,000 ton D.W.T. tanker." The drawings and plant layout were performed by the Cleveland Diesel Engine Division of General Motors. This was the GM division responsible for the many thousands of successful Model 248, 278 and 278A diesel engines which powered roughly half of US submarines during the Second World War. This may be a bit surprising, so here I'll show the detail block from the blueprint. 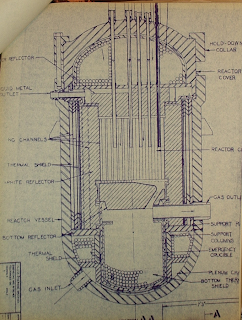 The reactor was to be graphite moderated, would have used highly enriched uranium fuel (UO2 dispersion in 316 stainless steel matrix clad with 316 stainless steel.) The core would have been 5 feet in diameter and 6.5 feet high. Many other details and considerations are contained in the report; I am sure I will present these here or elsewhere later on. As an interesting aside, some people are surely aware that this was not the only proposal of note in the MGCR program. Many other proposals were developed; some only reached the marketing stage with few meaningful details worked out, while others were as fully designed as the GM design was. Let's glance at two others as shown in documents I have here. Other views are given, and these will also appear somewhere later on. Manufacture of this plant would have been complicated, if the brochure is to be believed. American Turbine Corporation lists itself as a licensor to Escher Wyss, Ltd. of Zurich Switzerland who, it is stated, had extensive experience with fossil fuel heated closed cycle powerplants. This firm then lent its experience to American Turbine's staff to develop this MGCR concept. However, listed at the bottom of the back page as licensees to American Turbine are Westinghouse Electric, and Nordberg Manufacturing. This seems to imply that American Turbine had no intent of actually constructing the plant, which also is implied by the final sentence of text which reads "The American Turbine Corporation is available to discuss with you any special problems which you may have in adapting this power plant to your power needs, as well as licensing arrangements." Finally, a view of one component from a power plant as fully fleshed out as the General Motors plant was. This plant was designed for the MGCR program by General Atomic, a division of General Dynamics Corporation. 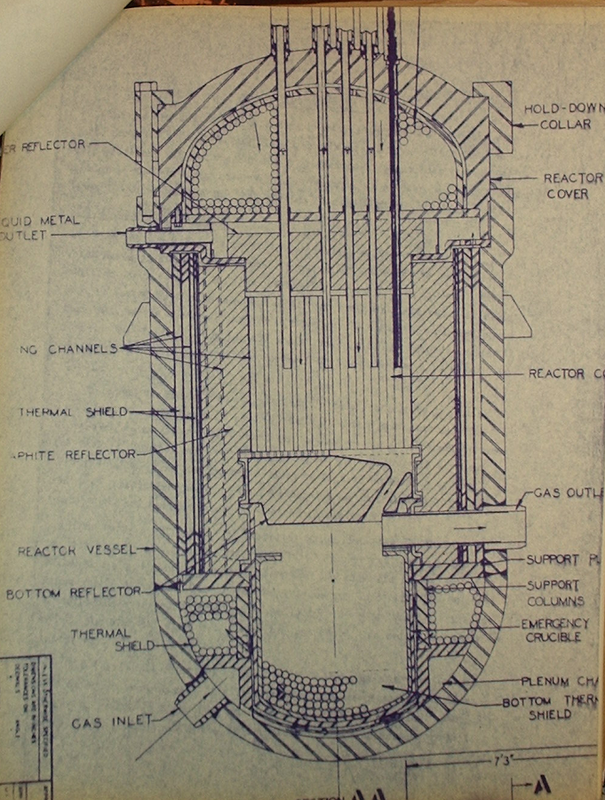 "In response to an invitation from the Maritime Administration for proposals on nuclear propulsion of merchant ships, some preliminary nuclear calculations were carried out by General Atomic early in 1956 on the above reactor concept using zirconium hydride as a solid moderator in a high-temperature gas-cooled system. This concept, with suggested structural details and adaptation to a closed cycle turbine-compressor power plant for a merchant tanker, was disclosed in the resulting proposal of March, 1956 to the Maritime Administration." The text then goes on to say that the resulting study following was prepared under AEC contract AT(04-3)-118 and was based on the previous proposal. This study then was a direct parallel to the General Motors study described earlier. Like the GM study, this plant had a thermal (reactor) power rating of 55 MW and a sustained shaft horsepower rating of 20000 SHP. Everything else was different, including the use of carbon dioxide as a working fluid. I hope you've enjoyed this little look into the closed-cycle nuclear plants which ended up going nowhere, but which for a brief time period certainly seemed as if they would. You can expect to see more about these in the future. APR note: These reports are part of a vast collection of material now in my hands which originated with a former employee of both Westinghouse (Bettis) and Sylvania-Corning Nuclear. Unit 3 at California's San Onofre Nuclear Generating Station has experienced a primary to secondary leak in one of its steam generators. This kind of failure cannot be described as everyday or commonplace to the point of normalcy, but this kind of failure does happen frequently enough that there are widely known and standardized procedures to deal with it. This type of failure usually results in plugging the U-tube or tubes if multiple which are leaking in the steam generator. Since each generator has many thousands of tubes, plugging several or even dozens does nothing to the heat transfer from the primary to secondary and in no way makes the plant any more dangerous than it was before the leak occurred. Many plants have operated with dozens or hundreds of plugged steam generator tubes for many years. "At 1505 PST, Unit 3 entered Abnormal Operation Instruction S023-13-14 'Reactor Coolant Leak' for a steam generator leak exceeding 5 gallons per day. "At 1549 PST, the leak rate was determined to be 82 gallons per day. At 1610 PST, a leak rate greater than 75 gallons per day with an increasing rate of leakage exceeding 30 gallons per hour was established and entry into S023-13-28 'Rapid Power Reduction' was performed. "At 1630 PST, commenced rapid power reduction per S023-13-28 'Rapid Power Reduction'. At 1731 PST, with reactor power at 35% the Unit was manually tripped. At 1738 PST, Unit 3 entered Emergency Operation Instruction S023-12-4 'Steam Generator Tube Rupture'. "At 1800 PST the affected steam generator was isolated." San Onofre 3 is a Combustion Engineering pressurized water reactor. The containment style at this plant is dry, ambient. The steam generators on San Onofre 2 and 3 are however not original to the plants. These steam generators were manufactured by Mitsubishi Heavy Industries in Japan, and were installed as replacements for both plants' original CE steam generators. There are now reports circulating fairly widely that NRC officials have noted excessive wear on a number of the steam generator U-tubes in San Onofre Unit 2, which is presently shut down for refueling. Clearly, with a tube rupture or leak having occurred in identical equipment while at power on the same site, a much deeper investigation will take place. There are reports circulating that "a radiation leak has shut down the San Onofre nuclear plant." The cause of the shutdown was a primary to secondary leak, not a "radiation leak," whatever that is. There are reports that a small amount of radioactive material in gaseous form may have been released to the atmosphere. I am continuing to look into this - but NO threat to the public exists. The plant is shut down, and the affected loop is isolated from the reactor. 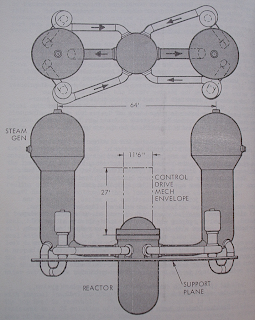 Here is a view of a typical Combustion Engineering pressurized water commercial nuclear plant primary system - called typically the NSSS or Nuclear Steam Supply System. In the large steam generators seen at the sides, heat is transferred from the primary coolant (circulated through the reactor by large pumps, clearly visible) into the secondary water as the primary water passes through many thousands of small diameter tubes. On the outside of these tubes is the secondary water, which boils, turns to steam, and then powers the turbine generator and other plant equipment. If a primary to secondary leak occurs, then, it is possible for some radioactive material to enter the steam plant. Having said this, ALL steam plants at nuclear stations are designed with this eventuality in mind and primary-secondary leaks through small holes, or even tube ruptures, have occurred many times before. When controlled properly (as at San Onofre) there is no risk to the reactor, or its cooling or monitoring.